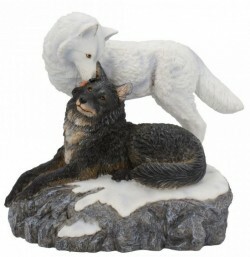 Beautifully detailed Wolf pair figurine designed by Lisa Parker. Excellent quality and solid resin stone-effect weighty ornament. A Veronese design with the artists initials engraved on the figurine. Felted underneath to protect surfaces. Will arrive within protective polystyrene casing in a decorative box with details of the artist.